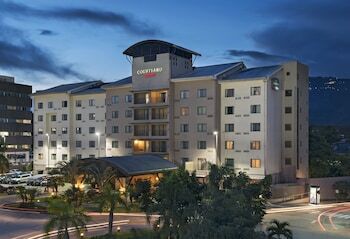 With a stay at Courtyard Marriott San Salvador in Antiguo Cuscatlan, you'll be connected to a shopping center, within a 10-minute drive of Estadio Cuscatlan and La Gran Via Shopping Center. Featured amenities include complimentary wired Internet access, a 24-hour business center, and complimentary newspapers in the lobby. Planning an event in Antiguo Cuscatlan? This hotel has facilities measuring 2422 square feet (225 square meters), including meeting rooms. Free self parking is available onsite. When you stay at Vista Sunzal Bungalow in La Libertad, you'll be near the beach, within a 5-minute drive of El Majahual Beach and Sunzal Beach. Free self parking is available onsite.